So, back with the theme of the original TV series, who wants to win the prize? And here we are with three fabulous questions – where is my significant growth going to come from? Who in my organisation is best placed to deliver it? And how will they deliver it for me? 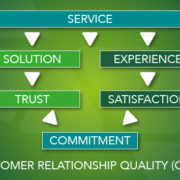 So, as we covered in our first blog on this topic, the answer to question 1 was to activate the Customer Attuned “Customer Relationship Quality” planning tool to provide the foundations of a performance matrix to assess your current business against the potential for each customer segment. So far so good. How do we go about question 2 – who in my organisation is best placed to deliver it? This is a question about your fundamental capabilities as an organisation – not just the sales teams, but those involved in delivering customer service at all the customer touch points, as well as a reality check on your overall proposition. In essence, it is about measuring your capabilities, objectively, and being able to identify the gaps that are stopping you from accessing the business potential that you have identified through question number 1. So here is answer number 2 – and again fulfilling the insight that we must have something that is consistent and repeatable – is activating the Customer Attuned Business Capability Builder assessment tool. It is an industry leading assessment tool, delivered by subject matter experts, that provides an objective assessment of your current commercial capabilities and identifies the gaps that require attention to activate your teams to deliver the business potential that has been identified. All aspects of your market, how your organisation approaches the market, and how you manage relationships with customers is included within the scope of the assessment. And here is something of real value that we provide as an additional benefit – we benchmark your capabilities against best practice from over 150 assessments across 12 industry sectors; nothing aspirational here, just real facts from real life delivering real financial benefits. So, here we go with the journey to winning the prize that your business could have; there is a way to find the source of your significant growth, and there is a way to know who is best placed to deliver it. The final $64,000 question is fundamental to making it happen – how will they deliver it? And of course, the answer will follow shortly ….